Happy Freddy Krueger Day! We have unearthed never-before-seen footage from the set of Freddy vs. Jason which features a very rare interview with Robert Englund sitting in the make-up chair, as he gets prepped and ready to fight Jason in the nightmare dreamscape unlike anything seen before it. Here, we get to see Robert Englund transform as he prepares for his final turn as the iconic dream demon. We recently rescued this footage from an old dusty VHS tape which is unique in that before Freddy Vs. Jason, New Line Cinema, Robert Englund and the creative forces behind the Nightmare on Elm Street franchise weren’t exactly open to letting the actor be seen in the make-up chair too extensively. They believed it destroyed the mystique behind this legendary horror character. Those rules became more lenient as time went on, and this video interview proves to be an important piece of history in terms of Freddy Krueger’s deep, dark legacy. The footage is an interesting look at what happens behind closed doors, as the gentleman known as Robert Englund transforms into the terrifying, one-liner spouting slasher killer known as Freddy Krueger. Englund opens up about the movie, and his thoughts about the script and one very controversial aspect of the casting process which had horror fans very upset way back in 2002, when this interview was shot. While patiently sitting in the make-up chair for his hours long transformation, Robert Englund goes into the controversial casting of Ken Kirzinger, who took over the role of Jason Voorhees after fan-favorite Kane Hodder had already played the Camp Crystal Lake slasher in the past four Friday the 13th movies. The move was surprising as both Hodder and Englund actively championed getting Freddy vs. Jason off the ground for years. Englund seems to be peace with director Ronny Yu’s decision to recast Hodder with Kirzinger, even though many Jason fans felt it was the wrong move. Kirzinger won the part simply because he was bigger. Englund says this. Before A Nightmare on Elm Street 3: Dream Warriors came out, Robert Englund wrote a treatment for Part 3 called Freddy’s Funhouse. It was never made, but bits and pieces have been pulled out, and used in the various other Nightmare movies that arrived after Dream Warriors. That includes Freddy Vs. Jason, which uses microfiche in one scene to tell the history and backstory of these two iconic characters. Englund says this about the scene, and how his idea for Freddy’s Funhouse has been used over the years. Robert Englund further goes into the new make-up process and how the effects have evolved over the course of the series. Englund also goes onto talk about the script, and what he likes about it. He was particularly looking forward to Jason’s dreamscape at the time. He also delves into some of the Easter eggs and connections to previous A Nightmare on Elm Street movies. This is a captivating time capsule that goes back to Englund’s final performances as the scary dream demon. It’s unlikely that we’ll ever see Robert Englund starring as Freddy on the big screen ever again. This never-before-seen footage also shows director Ronny Yu watching takes from behind the monitor, as his actress screams out in terror. There is footage of actress Katharine Isabelle, who offers her thoughts on the shoot, admitting that she hasn’t slept much since the production started. She even leaks a spoiler about her own ultimate demise. There is even some cool footage of Freddy’s boiler room as it appears in Freddy Vs. Jason, but the real take away from this lost footage is that interview with Freddy Krueger, who sits in the make-up chair, getting ready for his big face-off against Jason Voorhees. It’s exciting to see Englund getting back into the make-up for Freddy Vs. Jason. There is also footage of Freddy’s stand-in wearing the iconic green and red sweater on set. The very end of this unearthed footage even has Robert Englund getting into character as Freddy, as he talks about ‘dispatching’ Kelly Rowland, who co-stars in the movie, threatening to come after Nelly next. Once that deed is done, he’s moving onto the boy bands of the early 2000s. He promises there will be ‘no trance’ in his pants, and that this ‘ain’t no disco’. 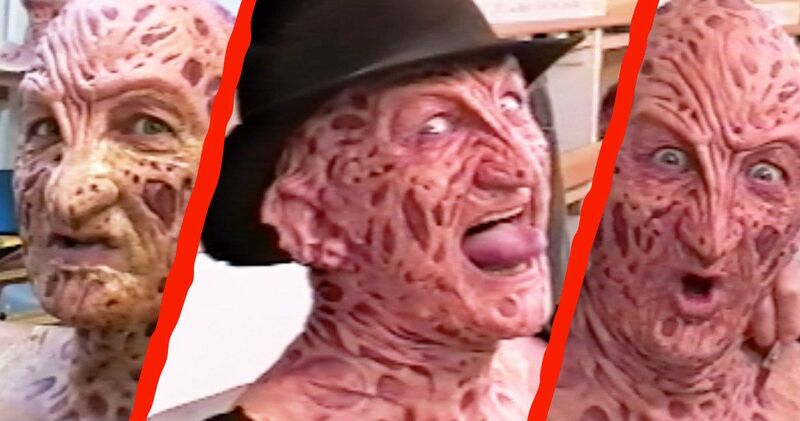 This is some pretty exciting old footage of Robert Englund as he prepares to play Freddy Krueger one last time.